We’ve heard from you that you’d like Tasks to be the one destination to track what you need to do in G Suite. These features will help make sure all of your to-dos are in Tasks, and ensure that you can keep track of the deadlines associated with them. Additionally, importing reminders to Tasks can help your users if your organization is currently transitioning from Inbox to Gmail. When you create or edit a task, you’ll now see a new “Add date/time” field. After clicking on Add date/time, you can enter the date, time, and recurrence of this task. When you open Tasks on the web or your mobile app, you’ll see a prompt to copy your existing reminders over to Tasks. You can also trigger this manually by opening the overflow menu in the top right. You’ll be able to select which list in Tasks you’d like to add them to, or create a new list. You can also indicate whether or not you’d like these reminders to be deleted once they are copied. Every task now has two time-based properties, date and start time, that are available in the edit screen of each task. These tasks will then show up in Google Calendar on the web at their specific time, as long as you have the “Tasks” calendar enabled on the left-hand side. 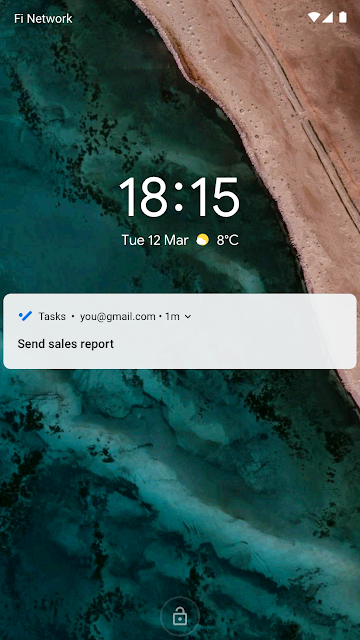 If you’ve enabled mobile notifications, you'll also get notified for tasks at their scheduled dates and times in the Tasks mobile apps (Android/iOS). For tasks that have a date, but don’t have a time, you’ll get notifications at 9am local time. If a task wasn’t marked as completed, you’ll get a second notification at 9am the day after a task was due. This import tool will pull your reminders (from Inbox/Gmail, Calendar, or the Assistant) into Tasks. When importing reminders into Tasks, we’ll copy over the title, date, time and recurrence of the reminder. Please note, reminders with locations associated will not be imported. Additionally, this is a one-time import and not a constant sync. Both features will be ON by default.